Pope Zacharias was born in 679, a native of the Roman province Magna Graecia, in Southern Italy; specifically he was of Greek parentage from Santa Severina, Calabria, and he was the last pope of the Byzantine Papacy. Most probably he was a deacon of the Roman Church and as such signed the decrees of the Roman synod of 732, and succeeded Pope Gregory III on 5 December 741. He was a man of singular meekness and goodness; and so far from any thought of revenge, that he heaped benefits on those who had persecuted him before his promotion to the pontificate. Soon after his elevation Zacharias notified Constantinople of his election; it is noticeable that his letter was not addressed to the iconoclastic Patriarch Anastasios but to the Church of Constantinople. The envoys of the pope also brought a letter for the emperor. After the death of Leo III (18 June 741) his successor was his son Constantine V Copronymos. However, in 742 Constantine's brother-in-law Artabasdos raised a revolt against the new emperor and established himself in Constantinople; thus when the papal envoys reached Constantinople they found Artabasdos the ruler there. 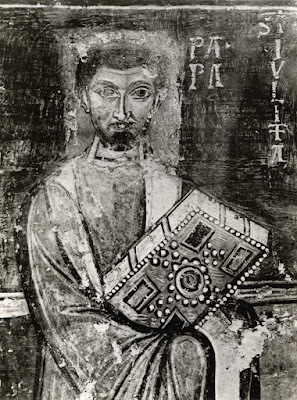 As late as 743 the papal letters were dated from the year of the reign of Constantine V; in 744, however, they are dated from the year of the reign of Artabasdos. Still the papal envoys do not seem to have come into close relations with the usurper at Constantinople, although the latter re-established the veneration of icons. After Constantine V had overthrown his rival, the envoys of the pope presented to him the papal letter in which Zacharias exhorted the emperor to restore the doctrine and practice of the Church in respect to the veneration of images. The emperor received the envoys in a friendly manner and presented the Roman Church with the villages of Nympha and Normia (Norba) in Italy, which with their territories extended to the sea. Zacharias' predecessor's alliance with the Lombard Duke of Spoleto put papal cities at risk when the Dukes of Spoleto and Benevento rebelled. Zacharias turned to King Liutprand the Lombard directly. Out of respect for Zacharias the king restored to the Church of Rome all the territory seized by the Lombards and sent back the captives without ransom. At the request of the Exarchate of Ravenna, Zacharias persuaded Luitprand to abandon a planned attack on Ravenna and to restore territory seized from the city. Zacharias corresponded with Saint Boniface, the apostle of Germany. He counseled Boniface about dealing with disreputable prelates such as Milo of Trier. "As for Milo and his like, who are doing great injury to the Church of God, preach in season and out of season, according to the word of the Apostle, that they cease from their evil ways." Saint Boniface also wrote to him against a certain priest, named Virgilius; that he labored to sow the seeds of discord between him and Odilo, duke of Bavaria, and taught, besides other errors, that there were other men under the earth, another sun and moon, and another world. Pope Zacharias answered, that if he taught such an error he ought to be deposed. This cannot be understood as a condemnation of the doctrine of Antipodes, or the spherical figure of the earth, as some writers have imagined by mistake. The error here spoken of is that of certain heretics, who maintained that there was another race of men, who did not descend from Adam, and were not redeemed by Christ. Nor did Zacharias pronounce any sentence in the case: for in the same letter he ordered that Virgilius should be sent to Rome, that his doctrine might be examined. It seems that he cleared himself, for we find this same Virgilius soon after made bishop of Saltzburgh. The birth of Frankish Civilization is described in a letter of Saint Boniface to Pope Zacharias in 741. The Franks had rid the Church in Francia of all Roman bishops by 661 and had made themselves its bishops and clerical administrators. They had divided up the Church's property into fiefs which had been doled out as benefices according to rank within the pyramid of military vassalage. These Frankish bishops had no Archbishop and had not met in Synod for eighty years. They had been meeting as army officers with their fellow war-lords. They are, in the words of Saint Boniface, "voracious laymen, adulterous clergy and drunkards, who fight in the army fully armed and who with their own hands kill both Christians and pagans." Fifty three years later the successors to these illiterate barbarians condemned the East Roman Empire as "heretical" and "Greek" on Icons at their Synod of Frankfurt in 794 and then on the Filioque at their Synod of Aachen in 809. For 215 years the Roman Popes refused to conform to their Frankish masters on Icons and the Filioque. At Boniface's request, the Pope confirmed three newly established Bishoprics of Wurzburg, Buraburg, and Erfurt. In 742 he appointed Boniface as papal legate to the Concilium Germanicum, hosted by Carloman. In a later letter Zacharias confirmed the metropolitans appointed by Boniface to Rouen, Reims, and Sens. In 745 Zacharias convened a synod in Rome to discourage a tendency toward the worship of angels. He sanctioned the deposition of the last Merovingian King of the Franks, Childeric III. In response to a question by Pepin the Short, the Pope said that in these circumstances, the de facto power was considered more important than the de jure authority, an endorsement Pepin was later able to present to an assembly of the Frankish nobles and army. Pepin was subsequently crowned King of the Franks by Boniface at Soissons in 752. Zacharias adorned Rome with sacred buildings, and with great foundations in favor of the poor and pilgrims, and gave every year a considerable sum to furnish oil for the lamps in Saint Peter’s Basilica. Zacharias built the original Church of Santa Maria sopra Minerva over an ancient temple to Minerva near the Pantheon. He also restored the decaying Lateran Palace, moving the relic of the head of Saint George to the Church of San Giorgio al Velabro. Also in Rome, some Venetian merchants bought many slaves in the city to sell to the Muslims of Africa; however, Zacharias forbade such traffic and then paid the merchants their price, giving the slaves their freedom. Pope Zacharias died on 15 March 752 and was buried in Saint Peter's Basilica. Zacharias was succeeded by Stephen, who died soon before his consecration and is not considered a valid pope. He was then followed by another Stephen who became Stephen II. A man of great erudition, Zacharias translated the Dialogues of his predecessor Gregory the Great for the Greek monasteries of Rome and Italy. Several letters and decrees remain of him. Church historian, Johann Peter Kirsch said of Zacharias: "In a troubled era Zachary proved himself to be an excellent, capable, vigorous, and charitable successor of Peter." 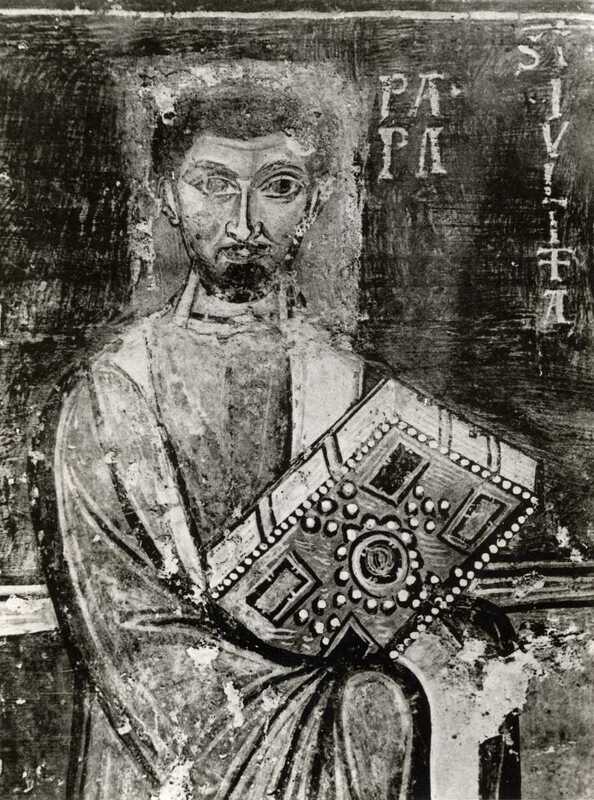 Peter Partner called Zacharias a skilled diplomat, "perhaps the most subtle and able of all the Roman pontiffs, in this dark corridor in which the Roman See hovered just inside the doors of the Byzantine world." In the Roman Martyrology, he is remembered as follows: "March 15 - In Rome, Saint Zacharias, Pope, who curbed the vehemence of the Longobard invasion, pointed out to the Franks what right government was, endowed the Germanic peoples with churches and held firm union with the Church of the East, governing the Church of God with great care and prudence."